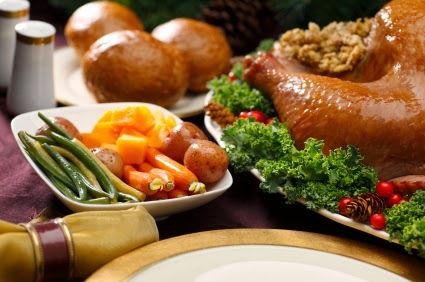 Buy a frozen turkey instead of fresh - While a fresh turkey may taste better, a frozen turkey can save a lot of money. Check out your local markets and you may find that the cost of a frozen turkey is between thirty and sixty cents a pound cheaper than a fresh turkey. While the preparation of a Thanksgiving turkey is a bit more complicated (given the amount of time it needs to thaw) with a frozen turkey, the savings is probably worth it. Avoid the "trap" of decorative cups and plates - Forget about the expensive paper plates, cups and disposable utensils that you can purchase for Thanksgiving. If you insist on purchasing disposable cups, enlist the help of the children in the household for decorating them. They will enjoy the challenge of doing the decorating and your guests will enjoy seeing their hand crafted cups. Use your standard plates and flatware and enlist the help of guests for cleanup. Enlist the help of guests - Ask those who are invited to help with preparation of parts of the Thanksgiving dinner. Assign a guest to bring vegetables, snacks and dessert and cut down on how much you have to spend on Thanksgiving dinner. Avoid purchasing pre-made pies and cheese trays and make them yourself at home. Keep an eye on sales - In the weeks between Halloween and Thanksgiving many stores will run sales on items such as poultry stuffing, gravy (or you can make your own turkey gravy from drippings), cranberry sauce and vegetables. If you are careful buying vegetables such as potatoes for mashed potatoes and butternut squash, they will last a couple of weeks. Purchasing items on sale when you see them can help you save money on Thanksgiving dinner. Wines and other beverages - Keep an eye at your local liquor stores for specials on wine. Frequently, you will find some of your favorite wines (such as Rieslings which are a great addition to a Thanksgiving dinner) on sale. Purchase them ahead of time and keep them icy cold until you need them for Thanksgiving dinner. Thanksgiving dinner is a big affair for most of us as we gather with our family and friends and give thanks for what we have. Do not break the budget serving a great Thanksgiving dinner, use some of these great money saving tips for Thanksgiving to stay within your budget.